Northrop Grumman's MQ-8C Fire Scout makes its European debut at the Royal International Air Tattoo on July 13, 2018. 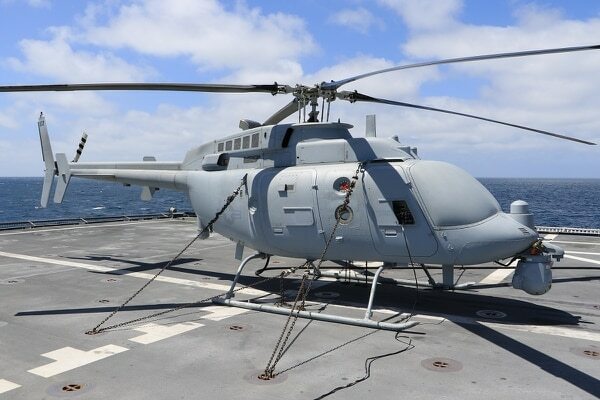 The unmanned helicopter was displayed near an anti-submarine warfare sensor from U.K. defense firm Ultra Electronics. 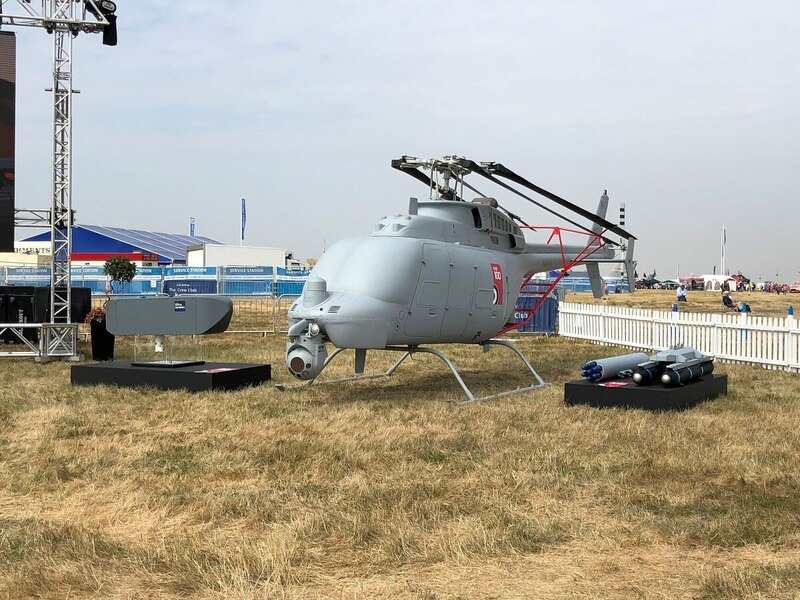 RAF FAIRFORD, England — Northrop Grumman’s MQ−8C Fire Scout unmanned helicopter is making its European debut Friday at the Royal International Air Tattoo, giving potential international customers their first chance to get up close and personal with the drone. The unmanned aerial system won’t be flying at RIAT this weekend — in fact, this MQ−8C has had its avionics stripped out and is intended as a showpiece. However, Northrop hopes to showcase the Fire Scout’s ability to accomplish a mission set it hopes will entice foreign buyers: anti-submarine warfare. The Fire Scout at RIAT will be displayed alongside a new anti-submarine warfare pod not currently in use by the U.S. Navy. Northrop believes the drone can serve as a longer-endurance alternative to manned helicopters, which are widely used by international countries to perform the ASW mission today. Read more from the 2018 Royal International Air Tattoo! Aside from the ASW pod, which is made by U.K.-based defense contractor Ultra Electronics, the MQ−8C at RIAT will also be paired with radomes from Leonardo’s Osprey 30 active electronically scanned array radar. Northrop is currently integrating that radar with the unmanned helicopter, with a planned early operational capability planned in 2019 and initial fielding in late 2020. “That radar is a fantastic radar. There are two arrays that are integrated into the aircraft and give a huge field of coverage,” Thomas said. The MQ−8C — an unmanned version of the Bell 407 with Northrop-devised controls that allow it to autonomously take off and land on ships — is currently bound within the line of sight of the ship upon which it’s embarked, although the Navy has a technology road map that would allow it to go beyond that. However, even now, the altitude that the MQ−8C flies at allows it to see way past what a shipboard radar would normally be capable of doing, Thomas said. Fire Scout is set to be fielded aboard the Freedom- and Independence-class littoral combat ships to conduct surveillance. The “Charlie” version of the system has double the endurance and three times the payload of the earlier MQ−8B model. The MQ−8C is scheduled to hit a number of milestones over the next year as it moves from development to fleet integration. Last week, the Navy conducted at-sea tests of the Fire Scout aboard littoral combat ship Coronado for the drone’s initial operational test and evaluation period, and the service will now begin land-based tests, Thomas said.